(CNN) - A Harvard club's plans to stage a satanic "black Mass" were abruptly cancelled Monday after drawing fire from the Archdiocese of Boston and condemnation from the president of the Ivy League school. Lucien Greaves, a spokesman for the New York-based Satanic Temple, told the Boston Globe late Monday that the event was called off because no venue was available. “Everyone involved, outside of the Satanic Temple, got really scared,” Greaves told the newspaper. “And I don’t necessarily blame them, because I understand that they were getting a lot of vitriolic hate mail, and I don’t think they expected it." Greaves was not immediately available for further comment. A petition to stop the black Mass had garnered 60,000 signatures, according to Aurora Griffin, president of the Harvard Student Catholic Association. The Harvard Extension Cultural Studies Club had planned host the two-hour ceremony at the Queens Head pub in Memorial Hall in on the school's campus in Cambridge, Massachusetts. It is unclear why the building was no longer available. The history of black Masses is murky, but Catholics say the intent of such ceremonies is obvious: to mock their rituals and beliefs. The Masses often parody Catholic sacraments, such as Communion, and liturgical vestments. The cultural club said it also plans to host a Shinto tea ceremony, a Shaker exhibit and a presentation on Buddhist meditation. But Harvard University President Drew Faust called the plans to reenact a black Mass "abhorrent." (CNN) - She's not one of us. That's what Satanists are saying about accused "Craigslist killer" Miranda Barbour. The 19-year-old told The Daily Item, a Pennsylvania newspaper, that she joined a satanic cult in Alaska when she was 13 and participated in several murders. Barbour, who has been charged with one slaying in 2013, told the newspaper that she has been involved in at least 22 killings. But authorities haven't corroborated her claims, and top Satanists say they have no ties to Barbour or her husband, Elytte Barbour, who is also charged in the 2013 killing of 42-year-old Troy LaFerrara. Police say LaFerrara responded to a "companionship" ad placed by Miranda Barbour on Craigslist. (CNN) - Satanists have unveiled their design for a proposed statue at the Oklahoma state Capitol, including a place for people to sit on the devil's lap "for inspiration and contemplation." The New York-based Satanic Temple submitted its proposal to Oklahoma officials this month after applying for a spot on Capitol grounds late last year. The Satanists say their statue would "complement and contrast" with a Ten Commandments monument placed at the Capitol in Oklahoma City in 2012. The Satanists' proposed monument depicts Baphomet, a goat-headed pagan idol sitting on a 7-foot-tall throne inscribed with an inverted pentagram. In an artist's rendering provided by the Satanic Temple, smiling children look adoringly at the devilish figure. 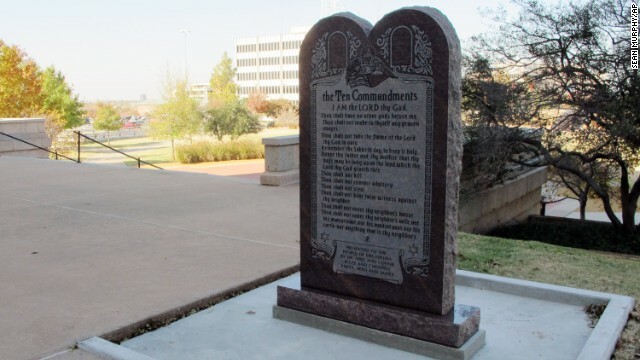 A Ten Commandments monument erected outside the Oklahoma state Capitol. (CNN) - Lots of lawmakers have been accused of devilish behavior, but Oklahoma's state capitol may become the first to actually have a monument to Satan. If a New York-based group called the Temple of Satan gets its way, a statue of the Evil One would sit next to the recently erected 10 Commandments monument on state capitol grounds. "They said they wanted to be open to different monuments," said Lucien Greaves, a spokesman for the Temple of Satan, "and this seems like a perfect place to put that to the test." Greaves and some legal experts say the Constitution is clear: the government can't endorse one particular religion. So, if a state capitol has a monument to one faith, it must allow monuments to others as well. The UK Church of Satan says it supports a variety of views on abortion. But is the church real? (CNN)- Are Satanists for or against abortion? Apparently, there's a hot debate. 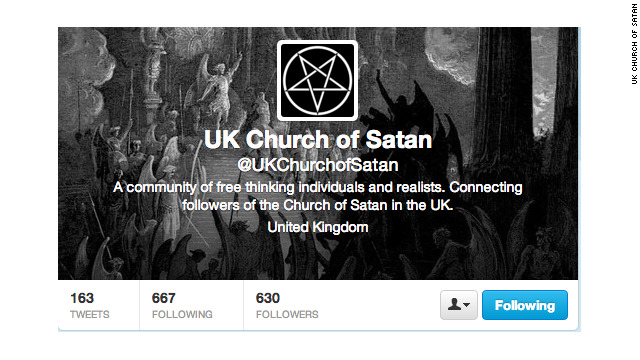 A group calling itself the "UK Church of Satan" on Twitter says it's open minded, tweeting out "Why Wouldn't Satanism be pro-life?" on July 5. But the High Priest of the New York-based Church of Satan says it's squarely in the abortion-rights corner. How to settle this diabolical duel? Washington (CNN) – We 'lift the bun' to hear from Rep. Emanuel Cleaver who explained to CNN's Wolf Blitzer the debt deal went against every major religion. On Monday he tweeted, "This deal is a sugar-coated Satan sandwich. If you lift the bun, you will not like what you see." The four-term Missouri Democrat continued his Twitter diatribe against the deal to raise the amount of money the nation can borrow and make a down payment on the federal deficit saying, "This debt deal is antithetical to everything the great religions of the world teach, which is take care of the poor, aged, vulnerable." You can follow us on Twitter @CNNBelief. (CNN) - You probably won't hear "Amazing Grace" at a Satanist's funeral, but you just might hear "My Way" by Frank Sinatra. A researcher from Concordia University recently published a journal article with some rare access to high level Satanists exploring what they think about death and dying. Members in the Church of Satan are traced back to Anton LeVey who in 1966 founded the church in San Fransisco. He is also the author of the canon of sorts for the group, The Satanic Bible first published in 1969. Today, the church is based in New York and membership numbers are hard to come by. One of the main tenets of the faith is atheism. Not just a disbelief in God but also in the devil or Satan. Satanists believe God is an invention of man and instead deify themselves. In downtown Oklahoma City, Satanists held a Ritual in public at the Civic Center. The ritual began at 8 p.m. Thursday and drew plenty of controversy. Before making it inside where the Satanists were practicing their religion, prayers were heard outside by groups opposing the ritual. Chiquita Carbajal said she is against the ritual. “No place for Satan in Oklahoma,” she said. Editor's Note: CNN Correspondent Jim Acosta and I spent some time this weekend at the Values Voter Summit in Washington, DC. There were plenty of Tea Party rock stars who spoke at the event including Christine O'Donnell, who may have some explaining to do to social conservatives after comments about her dabbling in witchcraft surfaced over the weekend. Officials confirmed that the Oklahoma City Civic Center has been booked by a group proclaiming themselves to be Satanists. The Church of the IV Majesties posted an event to meetup.com announcing a Satanic ritual to be performed at the Civic Center on Oct. 21. According to the posting, "This is a church for any Satanist (modern or traditional) or anyone who is interested in Satanism. All members of the Left-Hand Path are welcome. Do (sic) to the nature of our religion and the herd's view of it, this site will remain private as to protect our members. For now, this church is for all things LHP. So, welcome witches and warlocks, answer the call of your Darkness."